Matt O'Connor has swapped Leicester Tigers for Leinster and will preside over the reigning RaboDirect PRO12 champions for the 2013-14 season as he steps into Joe Schmidt's shoes. The son of a former Australian rugby league player, O'Connor played most of his club rugby in Canberra with the Brumbies and was capped at senior level by Australia against Ireland. He also took in a spell in Super League and a couple of seasons in Japan. O'Connor coached in Japan before his return to Australia where he worked for four years with the Brumbies during which time he also coached Australia 'A' before joining Leicester Tigers. 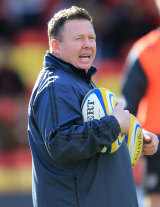 He joined the Tigers coaching team in early 2009, with Tigers picking up the Premiership trophy at Twickenham and after retaining the Premiership title in May 2010, O'Connor became head coach in July of that year under Richard Cockerill. And after guiding them to the 2013 Premiership title, O'Connor took up a three-year contract with Leinster.